The Irelands team would like to thank all bidders and underbidders at the September Spring Bull Sale on Friday 11 September. Top price bull was Irelands Kelleher K34, who sold to a top of $28,000 to Bill and Shauna Graham, Bonbongo Angus, Coolac NSW. Special mention to volume buyers Peter Richards Alpine Maintenance, Swifts Creek buying four bulls and and Ian and Pammie McLennan, Goulburn NSW for the purchase of 3 bulls. 40 out of 48 lots sold to average $7013 with the remaining lots selling immediately at the completion of the sale. Pictured: (L) Lot 3 with Corey Ireland and Jim Bruce and (T-R) Willie Milne, Peter Richards and Corey Ireland (B-R) Willie Milne, Tony Dowe, Pammie & Ian McLennan and Corey Ireland. 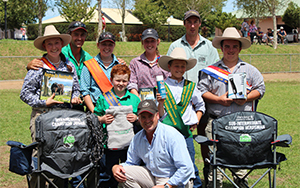 We would like to thank all buyers and underbidders for the Irelands lots at this years RAS Sydney Show Angus Sale. Congratulations to Kerringa Angus, South Australia, on the successful purchase of Lot 53, Irelands Rosebud J375, for the sale top price of $22,500 and Lot 45, Irelands Lass H245 for $14,000. Also thanks to John Sultana for the purchase of Irelands Bunyip J338 for $4000. Join us for a cuppa and a chat on Tuesday 27 Of Jan (Day 1 of Beek Week) and a look through the 2015 Autumn sale bulls.